Montpelier Section work day on Long Trail from the Route 108 picnic area in Stowe north to Sterling Pond Shelter, and Sterling Pond Trail from the top of Smugglers Notch to Sterling Pond Shelter. 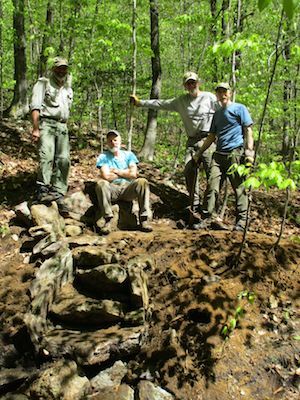 Trails and Shelter prepped for start of 2017 hiking season. Eleven volunteer workers contributed 74 hours of work and travel time. The disadvantage of starting early as we did was not knowing who had come out for work crew. We got our ladder repair done and began blowdown clearing on our way down as that crew hadnâ€™t met us yet. Just after they did a guy who identified himself as "John's brother" came along and told us "John was on the Picnic Area trail with Andrew." We thought that was you, John [Buddington], and that there just hadn't been enough people to tackle the stairs, so we continued with trail work, not realizing our mistake until we met up with Andrew and John Paige! We were disappointed not to have been part of your stair crew, but you two did a fantastic job! Thank you. I'll get back up the trail soon to see how the steps are holding up. Picture attached, and I told Rob (GMC Volunteer Coordinator) that you were missing from the photo, Ken.